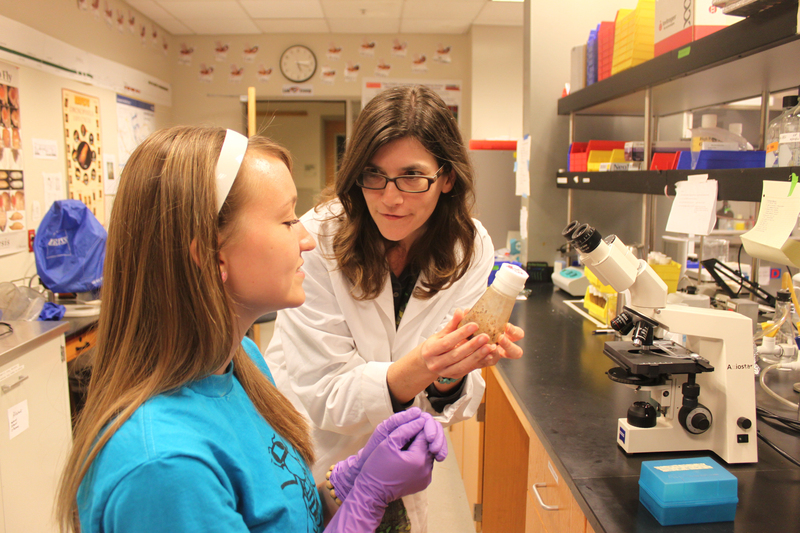 Professor of Biology Jennifer Armstrong commenced her new role as associate dean of faculty this summer. Professor Armstrong has been at Scripps and on the Keck Science faculty since 2003. She has served as the faculty advisor to the Scripps Post-Baccalaureate Premedical Program, been the recipient of the Mary W. Johnson Faculty Achievement Award in Teaching from Scripps College and the G. David Huntoon Senior Teaching Award from Claremont McKenna College, published widely, and been the recipient of four grants from the National Science Foundation. Professor Armstrong took time to sit down with the Office of Marketing and Communications to talk about her new role, the inner life of fruit flies, and binge-watching Star Trek. Scripps College: What is the main objective of the Office of the Dean of Faculty, and what is your role in that? Do you bring any specific plans or goals to the position? Jennifer Armstrong: The office assists faculty with their scholarship, research, and academic needs. As associate dean of faculty, I promote faculty development through workshops and programming for pre-tenure faculty. I also serve as the Institutional Review Board administrator and research integrity officer, and I serve on several committees at Scripps and across the consortium. A large part of my job is to focus on student academics and research. I oversee applications to internal Scripps fellowships and to external fellowships such as Fulbright and Watson. I also help to promote and celebrate student research, scholarship, and projects through the Fall Research Tea and Capstone Day. One of my new projects that I am particularly enthusiastic about involves supporting student research, faculty development, and innovative community-based teaching through our Mellon-funded Interdisciplinary Humanities Initiative. My goal for this position is to offer support and opportunities to faculty and students to help them accomplish their goals. SC: This isn’t our first time featuring you in our Spotlight on Faculty series. Just last year, you were reappointed faculty director of Scripps College’s Post-Baccalaureate Premedical Program. How does will your experience in the Post-Bac program inform your new role as associate dean? JA: Thinking back, it was my experiences advising career changing post-bacs that inspired me to apply for this position! I love being a professor of biology and I am passionate about my teaching and research. I was completely comfortable in that role. However, sometimes it is good to venture outside of one’s comfort zone. Watching the post-bacs leave their past professions to return to college and immerse themselves in unfamiliar coursework to fulfill their dream of becoming a physician inspired me to put myself into new situations where I may not be completely comfortable, but that would help me grow as an academic. SC: Will you still be teaching and researching? What’s a current project of yours? JA: I do plan on teaching Core II: Constructions of (Dis)Ability with Associate Professor of Writing Kim Drake in spring 2019. In regard to scholarship, my research uses fruit flies as a model organism to understand fundamental questions regarding chromosome structure and gene expression. In my research lab, my students are using the confocal laser microscope housed in Keck and funded by the National Science Foundation. We are looking directly at histone proteins on DNA in various fruit fly mutants to understand how chromosomes are maintained in living cells. It is utterly satisfying to look directly through a live cell and view chromosomes. The funny thing about fruit flies is that you can’t freeze them! So, my lab remains open as I transition into this new role, and I am fortunate to have several research students who are excited about continuing their projects. As my office has moved to Balch Hall, they are quickly becoming very independent. SC: You’ve made a successful career as a scientist, an educator, and now an administrator. Take us back, though: What first drew you to science? JA: I learned about genetics and Mendelian inheritance in seventh grade, and I was hooked. It was as if I had opened a chest that held the secrets to life. It was around that time that I discovered that as a scientist you could get paid to follow your curiosity. Who can pass up a job like that? SC: What do you think about when you’re not focused on chromatin remodelers or student affairs? JA: I enjoy spending my time with my son and husband. We have a needy dog that we try to incorporate into most of our family activities. My son plays soccer, so I am currently immersed in the role of soccer mom. As far as personal time, I have a deep appreciation for Star Trek and enjoy the occasional binge of old episodes and movies.